For much of the year, the Caño Cristales just looks like any other normal river that you could see anywhere in the world. Nestled in Colombia, even getting to this river is a difficult adventure in itself. Accessible only through the community of La Macarena, you can take a DC3 cargo plane from Villavicennco or a weekend flight from Bogota that requires a stay over. Between June and November, however, the Caño Cristales transforms from a basic river to the “River of Five Colors,” filled with endemic flora and fauna that will give you a once-in-a-lifetime viewing experience. If you like the idea of adventure, then seeing this river when it is in full bloom should be on your bucket list. You can make the effort to arrange everything on your own for this trip to save a few bucks, but purchasing a full package that includes your flights, lodging, and guide to the river is going to save you a major headache. The liquid rainbow river is becoming ever more popular and tour groups are routinely booking up all the lodging available in La Macarena. Unless you want to go camping at a moment’s notice, booking your full trip in advance will help you get the accommodations you want. A typical tour includes three days and two nights in La Macarena. Two day hikes, consisting of a short canoe trip, a Jeep ride, and a short hike of less than an hour are what is typically booked. In return, you get to see the incredible plants and corals that call the Caño Cristales their home. Most trips can be booked for around 1 million pesos, or about $500. Why Is the Caño Cristales So Colorful? One of the biggest reasons why the Caño Cristales can stay in bloom throughout the entire season is because it is completely devoid of fish life. The river contains no drag or sediment, making it impossible for fish to survive. 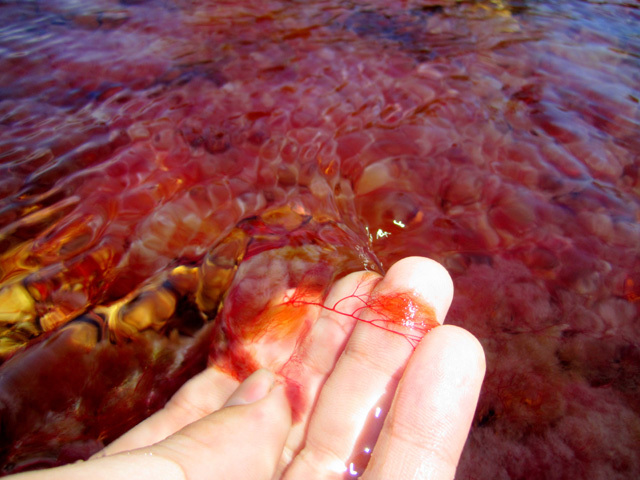 Though the experience is a little less impressive outside the regular season, the different channels of the Caño Cristales also contain red flora throughout the Winter season as well. Another part of the reason for the tremendous display of color is the mineral content of the water. There are many circular “pits” throughout the river basin that have been formed by the flowing water and high mineral content. As the minerals are deposited on the rocks, they begin to build up, providing life for the flora and fauna of the river. With yellow, green, black, blue, and the ever-present red during the season, nature really does put on a show in the Caño Cristales! Are You Thinking About Going to the Caño Cristales? Tours to see the Caño Cristales can be purchased directly from the La Macarena community website, as well as through several other reputable agencies. Considering the relatively low price that brings about the reward of seeing the River of Five Colors, it is difficult to find a better deal for such an incredible experience! The Caño Cristales is calling for you to visit this year… are you ready to go see it for yourself? Would it be possible to get in touch with someone who can arrange a tour to Cano Cristales from Bogota? We would like to leave in Bogota on 19th of August and get back in Bogota or Villavicencio on 22th of August in the morning. Our budget is around 1.200.000 COP !